The YMCA of South Palm Beach County serves local families through community events all year long. They know that video is fundamental to successful fundraising, and turn to Plum Productions to help drive contributions. Profile local families whose lives are greatly impacted by the YMCA at the organization’s annual Inspiration Breakfast. The breakfast is the Y’s biggest fundraiser of the year. 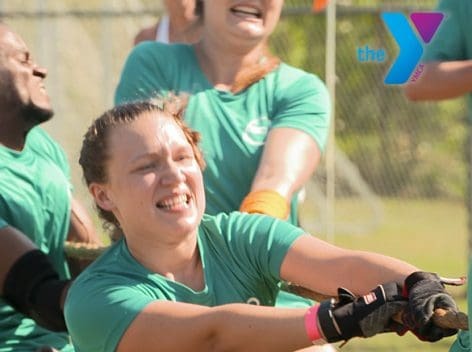 Promote the YMCA Corporate Cup Challenge, a team-building field day that raises funds to support the Y.
We’re pumped whenever we get a call from the folks at the Y. For the Inspiration Breakfast videos, we get to meet the most inspiring families in our local community. Telling their stories is a great responsibility; one we don’t take lightly. The Corporate Cup Challenge was one of the most fun shoot days we’ve ever had. Seriously, it was tempting to drop the camera and jump in on the action. It took three camera operators the capture it all, and shot selection in the editing room was painstaking. There was too much to choose from! People in our area have big hearts. Tug of War should be an Olympic Sport. Sweatbands never really go out of style. Let Us plan your next video!